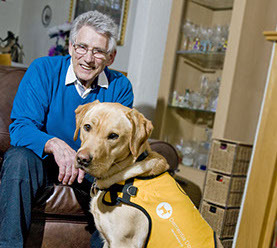 As the number of people diagnosed with a form of dementia continues to grow, assistance dogs trained specifically to help meet the needs of people living with dementia could provide a valuable new method of providing comfort and care. There is plenty of truth in the phrase “man’s best friend” when used about dogs. They have been at the side of people for thousands of years. As far back as the first century AD, dogs were depicted helping blind people to get around. Since then we have become used to seeing assistance dogs in action. Everyone is familiar with Guide Dogs for the Blind, and the excellent work that they do. Now, work is being done on using dogs to help people suffering from dementia; to make their lives easier. The use of dementia dogs is still in its early stages. One of the pioneering projects that is helping to forge the way for dogs to help in this area is based in Scotland. 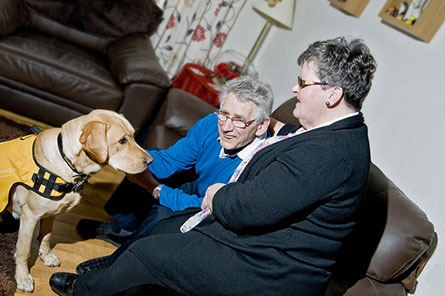 The Dementia Dog Project is a collaboration between Alzheimer’s Scotland and Dogs for Good. The aim of the project is to place dogs with couples; one of whom suffers from dementia, the other who is their carer. It’s also envisaged that dogs will eventually be trained to help with dementia-related issues in the wider community. 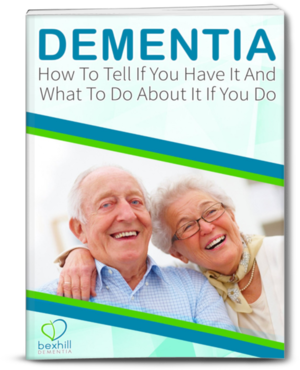 Dementia dogs do not just have practical benefits. There is significant evidence that having a pet can be psychologically beneficial to anyone who is suffering from Alzheimer’s or other forms of dementia. The dog becomes a friend and companion, and activities such as walking the dog create a positive routine in the dementia sufferer’s life. It’s also been shown that dementia sufferers tend to interact with other people while they are out walking their dog. This interaction tends to be in the form of simple questions about the dog’s name and age, so undue pressure is not placed on the individual. It’s possible to live independently when you have dementia, or to continue living with your partner. There are certain things that you need to think about, including possible adaptations to your home, and help with your ongoing daily needs. It seems as though getting a dementia dog could also be one of those considerations in the future. The Dementia Dog project is still in its early stages, but so far results have been positive. The project is a registered charity and has received a large amount of funding from the Life Changes Trust. If the project continues to receive the financial support it needs, it will continue to expand its programme of training and providing dogs in the future. The training will be developed according to the needs of the people with whom the dogs are to be placed. It seems as though “man’s best friend” is going to add another positive to its relationship with human beings.